Jai alai is a sport where a ball is bounced off a walled space. 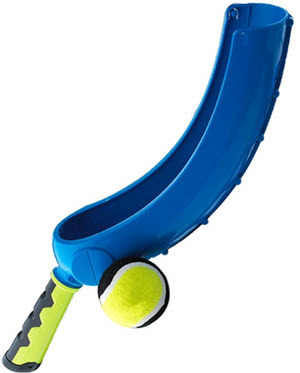 A hand-held device called cesta is used to accelerate the ball to a high speed. The speed record for a jai alai ball is 302 km/h. This speed was recorded set by José Ramón Areitio at the Newport Jai Alai in Rhode Island, USA. 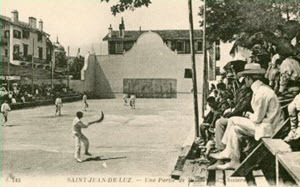 Basque pelota is a court game originally played in the Basaque Country in Spain and France. Several variations have been described historically, such as playing with a bare hand, playing using a racket, playing using a wooden bat and playing using a woven basket-glove. What most version have in common is that a ball is thrown again a wall. Jai alai fontons can be found in many US states. The first jai alai fronton in the United States was built in St. Louis, Missouri and opened around the 1904 World Fair in the city. It would take about 20 years before Florida got its first jai alai fronton. This one was built at the site of the Hialeah Race Course near Miami. (It has since been relocated to site near Miami International Airport). Within soon, jai alai was used as a basis for parimutuel betting, and turned into a popular gambling alternative to other parimutuel betting events such as horse racing and greyhound racing. Due to the warm Florida climate, professional jai alai players from temperate countries gathered in Florida during the winters, to avoid having to take a break from the game. A jai alai player that refrains from playing jai alai for a whole winter season can need several weeks to get into shape again in spring and risks serious injuries. Foreign jai alai players fleeing the cold started coming to Florida for the winter season as early as the 1920's. From the 1950s and onwards, the jai alai sport really boomed in Florida. The Miami fronton underwent a big renovation in the mid 1960s, partly to accommodate an expanded grandstand since the 7,000 seats of the old grandstand weren't enough anymore. After the renovation, the grandstand could comfortable room over 13,000 spectators. The Miami fronton was knicknamed “The Yankee Stadium of Jai Alai” since it was such a powerful symbol for the game in the U.S. On 27 December 1975, an audience of 15,502 spectators watched a game of jai alai in the Miami Jai-Alai Fronton, a world record that is yet to be broken. In the 1960s and 1970s, the state of Florida relaxed its gambling laws in an effort to increase state revenue. Legal betting on jai alai expanded, and this trend continued into the early 1980s. But jai alai's strong connection to gambling also contributed to its downfall. In an effort to earn even more money, the sports books created increasingly complex wagers for jai alai, which in turn made the sport less accessible for the average punter. With hopes of expanding the customer base, the Miami fronton dropped its old dress code requirements in favor of a more casual style. Back in the days, the dress code was pretty strict with men wearing jackets and women dressing up at a similar level. When the dress code was relaxed, jai alai lost some of its luster. 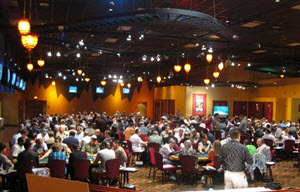 A new type of punters entered the facilities, but at the same time, many high rollers stopped coming. Jai alai also suffered from allegations of fixed games and ties to organized crime. 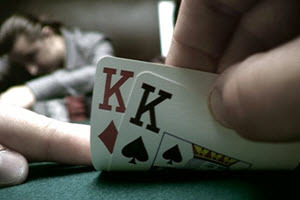 FBI investigations and federal indictments ensued, and the mere suspicion of corruption made the games less appealing to the average punter. A lot of gamblers turned to the new betting opportunities that had appeared, such as Native American Casinos and the cruise ships that brought gamblers out to international waters for a few hours of gambling. In 1988, a player's strike broke out. This strike lasted for roughly three years. The Miami fronton brought in “scabs”, and there were incidents of picket-line violence. Even though the strike ended eventually, the jai alai in Florida never really recovered. Today, jai alai has pretty much vanished from the north-eastern and western United States, where other legal betting options are now available, including land casinos and gambling cruises. The once famous Connecticut frontons in Hartford and Milford have closed for good, while the Bridgeport fronton has been turned into a greyhound track. In Rhode Island, the Newport fronton is now a parlor for slot machines and video lottery terminals. Once upon a time there were actually a fronton at the MGM Grand Hotel and Casino in Las Vegas, but this facility was hemorrhaging money so badly in the early 1980's that MGM decided to shut it down. In an effort to prevent the frontons in Florida from closing down, the Florida Legislature passed the HB 1059. This bill, which came into effect in August 2003, changed the rules for offering real-money poker games in parimutuel facilities in Florida. Today, most of the Florida frontons are kept solely because the owner wants to be able to offer legal real-money poker games and slot machines. The owner will pay professional jai alai players to play in the fronton simply to fullfil the legal requirements. 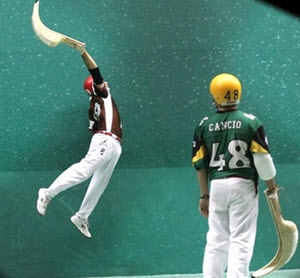 The fronton must present a minimum of 40 performances, with each performance being comprised of eight games, to keep its license. The law does not stipulate how many players that must participate, so in the fronton in Ocala, Florida there is usually only two players playing each other continuously. 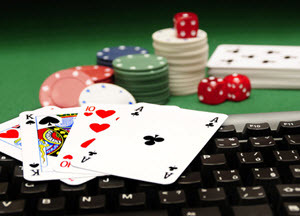 In many cases, the facility owner is actually losing money on the fronton, but it is still worth it since the parimutuel betting makes it possible to offer legal real-money poker and slot machines. The jai alai players union has even negotiated a deal where the professional players are paid a certain percentage of the slot machine revenue. 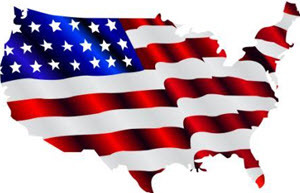 Most professional jai alai players in the United States are not born in the country, since jai alai isn't a very high profile game here anymore. Instead, they come from Cuba, Mexico or Southern Europe (typically from France or Spain, since this is where you find the Basque Country). While professional jai alai has lost much of its former glory in the United States, amateur jai alai is on the rise. In 2008, the nation's first public amateur jai alai facility was opened in St. Petersburg, Florida. The project was funded by the city of St. Petersburg and jai alai aficionado Jeff "Laca" Conway. 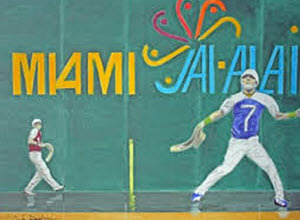 If you want to learn more about jai alai, a good starting point is the jai alai facility in North Miami Beach, Florida. This is an indoor air conditioned cancha sponsored by The American Jai-Alai Foundation, and it is possible to participate in free jai alai training sessions here.